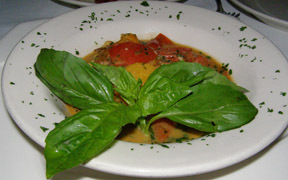 Bistro Mezzaluna is more than an excellent Italian restaurant; it is a well-kept Fort Lauderdale, Florida secret that must be shared. 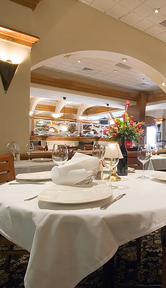 Executive Chef Brian Rutherford focuses his delectable menu on the important Fort Lauderdale staples: fresh seafood, pasta, steaks, and chops in an attractive setting. Entering Bistro Mezzaluna, where we were warmly greeted by the affable Julian as if we were regulars, and it was easy to see why locals have been steadily coming since the restaurant opened in 1993, and arrive early to have a pre-dinner cocktail at the intimate bar. The ambience of the dining room is attractive and comfortable with ivory linen draped tables flanked by wood chairs with black leather seats, black leather booths line the wood accented walls graced with paintings in gold frames, fairy lights dot the ceiling, hanging lamps and small lamps on the tables softly illuminate the room, and a pretty floral arrangement on a low wall added visual style and interest. It is the type of restaurant where you feel at home, and looking around the dining room we spotted several celebrities at the nearby, as well as a mix of locals and tourists. While we waited for our appetizers to arrive, Philip, our server, brought us a basket of delicious house-made bread, that looking into the open kitchen, we had seen the chef just remove from the oven. There is something so basic yet appealing about hot bread and butter that we had to remind ourselves not to overindulge. 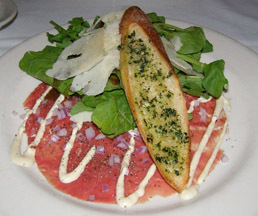 Edward began with an appetizer of Beef Carpaccio with Arugula, Red Onion, Shaved Reggiano, and Roasted Garlic Aioli, presented on a large white plate with a generous portion of carpaccio drizzled with garlic aioli, topped with diced red onion, arugula, large shaved Reggiano, and homemade bread spread with garlic butter and herbs. Paired with a 2006 Lyeth Pinot Noir, Sonoma, California, it was a perfect way to begin the evening. Florida is famous for its stone crab, and when I saw the Jumbo Stone Crab Claw on the menu, I could hardly wait for this delicacy to arrive as my appetizer. Beautifully presented on a bed of ice, the jumbo stone crab claw extended from one side of the plate to the other, served with requisite lemon wedges and mustard sauce, and parsley sprig garnishes. 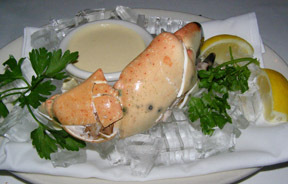 The stone crab was sensational, sweet and succulent, especially when paired with Gosset "Brut Excellence" champagne. 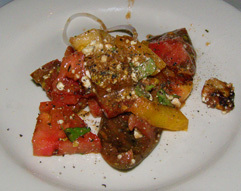 We continued with Heirloom Tomato & Gorgonzola Salad with Garlicky Croutons and Balsamic Syrup, which arrived as a large platter of mixed red and yellow tomatoes that were deliciously ripe with generous amounts of Gorgonzola, red onion rings, and drizzled balsamic syrup. Next came a pasta course of Goat Cheese Ravioli with Roasted Peppers, Tomatoes, and Pancetta that were delicately tender half moons of pasta pleasure filled with creamy goat cheese and topped with a mixture of roasted red and yellow peppers, tomatoes, and pancetta. When Philip told us that the snapper was fresh from Key West, Edward knew that he wanted this as his main course. 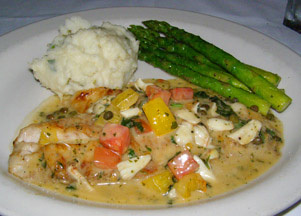 The Pan Roasted Yellowtail Snapper with Lump Crab, Capers, and Tomatoes was as good as it gets; presented as a generous filet bathed with a tasty wine sauce, and topped with lump crab, yellow and red diced tomatoes, and capers, accompanied by scallion mashed potatoes and tender asparagus spears. For my main course, I had the Lobster Francaise with Yellow Corn-Asparagus Ragout, Spinach and Roasted Sweet Potatoes, which really showcased the restaurant's style combining an art for flair and taste. 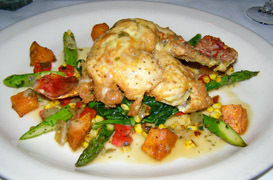 For this colorful dish, Chef Brian had removed the lobster from its shell, dusted it with flour, sautéed it and positioned it on a bed of tender wilted spinach and artfully arranged asparagus tips, cubed and roasted sweet potatoes, and a scattering of fresh sweet corn around the lobster, with a little pool of flavorful sauce. Bistro Mezzaluna has an impressive international wine list, and an extensive menu of daily specials as well as their regular items. The restaurant is open for dinner Monday through Thursday from 6:00 pm until 11:00 pm, Friday and Saturday from 6:00 pm until Midnight, and Sunday from 5:30 pm until 10:30 pm. 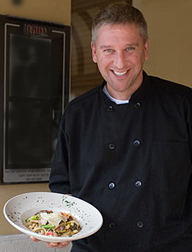 Read about Bistro Mezzaluna in the Chefs' Recipes section where Chef Brian Rutherford shares his delectable recipes for Pan Roasted Yellowtail Snapper with Lump Crab, Capers, and Tomatoes; and Chicken and Italian Sausage with Rigatoni and Balsamic.